Like ice cream? Willing to try something new? Then get a ticket for the artists Hunt & Darton's evening at The Canal Museum, where you'll learn all about gelato, and try some experimental flavours, including broccoli and crispy pig skin. Tickets for the night at just £15. "Hunt & Darton Cafe in collaboration with National Trust London will host a pop-up evening of interactive performance, mixing ice cream with art in London’s oldest ice cream factory. A fully functioning café that blends art with the everyday, Hunt & Darton Cafe is a social and artistic hub where spontaneity and performance meet great food and drink. Enjoy an evening celebrating the history of ice cream, brought to London by Carlo Gatti whose warehouse was once at The Canal Museum with its impressive ice well. 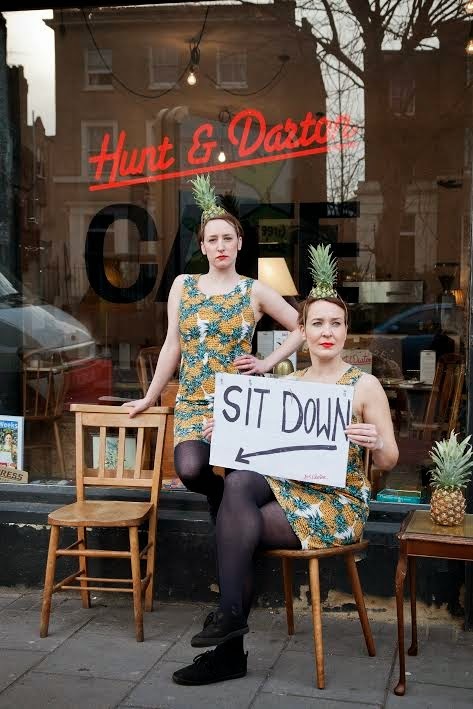 Hunt & Darton, wearing their iconic pineapple attire, will encourage playful participation and meaningful social encounters. Prepare yourselves for comic interaction, performances, guest waiters, service style and ice cream – served with a twist of course! Adorning the space with their lovingly handpicked charity shop crockery, kitsch objects and cardboard signage, Hunt & Darton will be joined by guest waiters including Brian Lobel and Richard Layzell – all of whom have been invited to invent their own unique ice cream flavours. Expect ice cream innovations (flavours will include broccoli and pig skin cooked until crispy), a performative tour of the building, coke floats and the chance to meet the man himself, Carlo Gatti! Hunt & Darton are Associate Artists of Arts Admin and Cambridge Junction. Hunt & Darton Cafe is supported by Arts Council England."